[n.b. this post is a work in progress. If I get more information on these houses I'll update and re-post. One really needs to look t deeds and city directories to get the full record of owners and residents, but that will have to wait]. Atlas of the city of Syracuse, N.Y. and suburbs (Philadelphia : G.M. Hopkins co., 1924 716 Westcott is number 11. 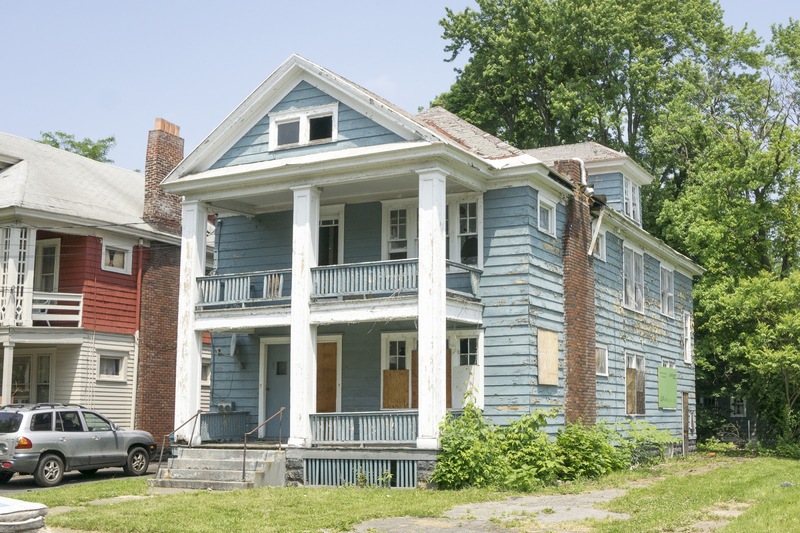 In the East End, the Onondaga Realty Company is busy in the work of putting up new dwellings. 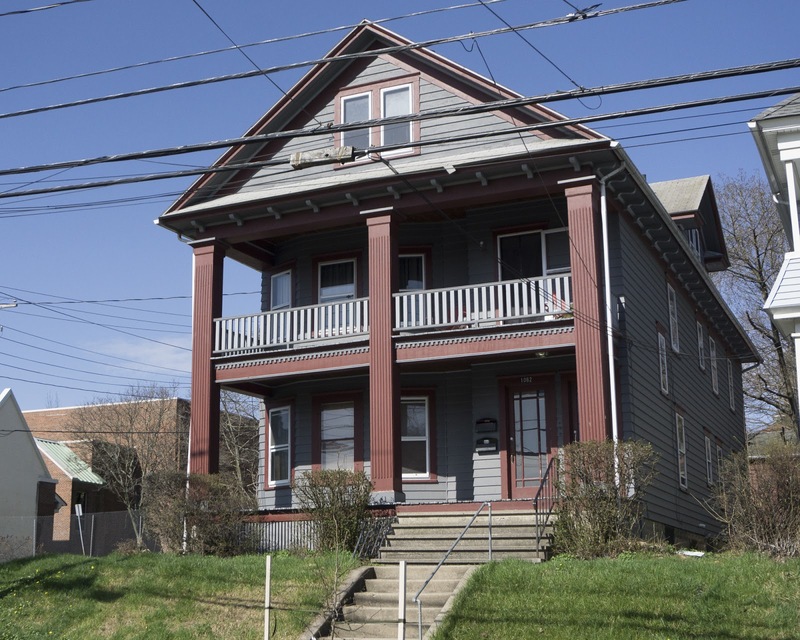 This company finds a good demand for houses, especially on University Heights. The architects say that they are kept busy in preparing plans for a good grade of houses and that home builders are beginning to recognize the advantages of having plans made by- experts, in which the artistic effect is given as much consideration as other features, which combine to make a home comfortable and' attractive. A house designed by a practical architect, they contend, will, as a rule, bring more money than one planned by an inexperienced man. should the owner at any time wish to dispose of. 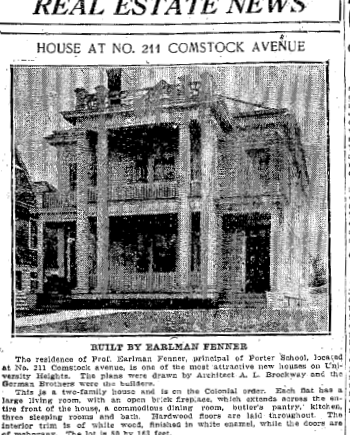 ("Demand for New Houses Keeps Up, Contractors Say," Post-Standard, April 15, 1910). We know of many architect-designed houses in the neighborhood from this time. A house designed by noted architect Albert L. Brockway at 211 Comstock was built in 1910 and is similar to 716 Westcott Street. Unfortunately, the house has now been been stripped of all it detail). 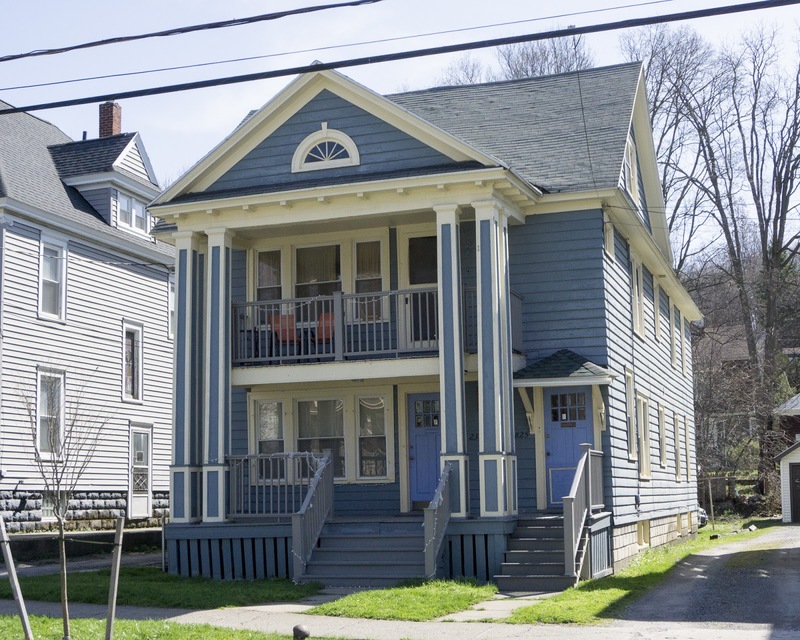 It has also been pointed out the the house resembles the most expensive version of Sears kit house, the so-called Magnolia, of which we have one example built in Syracuse at 1500 James Street, probably designed and built between 1918 and 1921. 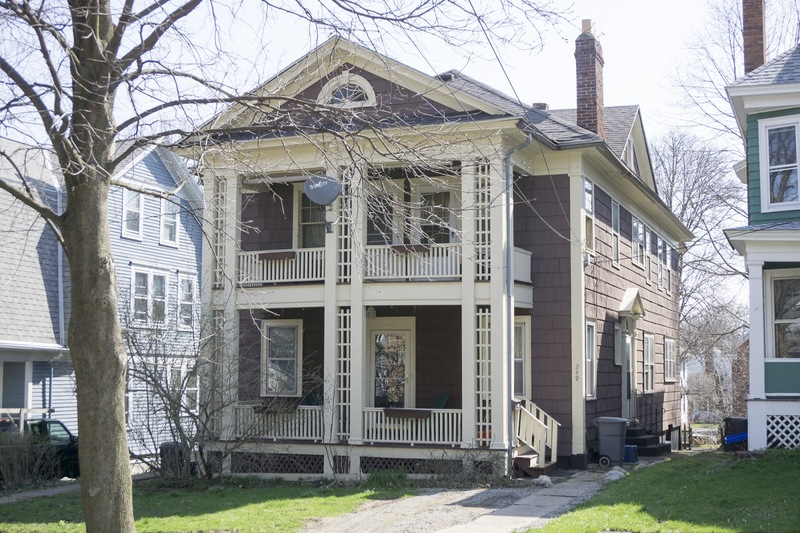 Another reference to the address in 1916 allows a pretty secure dating for 716 Westcott Street - even without consulting the property deed. At this time Hamilton H. wife and his new bride Katharine Cook were moving into the house after their marriage. Mr and Mrs. Hamilton H. White have returned from their wedding journey and are at home at 716. Westcott street. (Syracuse Herald, Dec. 10, 1916). 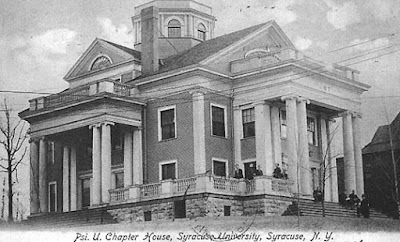 Hamilton Howard White (1885-1959) was a member of one of Syracuse's oldest families. 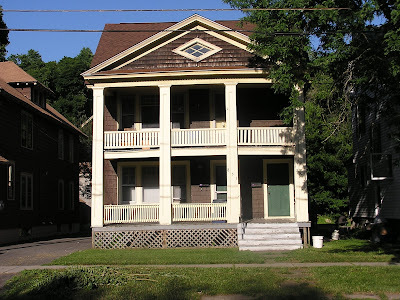 He was the grandson of Hamilton White (1807–1865) whose house faces Fayette Park and the son of Hamilton Salisbury White (1853-1899) the famed firefighter who is memorialized in a monument at the other end of Fayette Park. So in a certain sense perhaps "someone super wealthy" lived in the house - though we don't know how wealthy young White was when he was just 31 years old. As for being "cool," all I can say is that he worked in insurance his whole life as president of Hamilton White Inc., Insurance Agency. A solid citizen, yes. But "cool," I don't know (I'll have to ask Ham White his grandson who still lives in Syracuse). But the presence of young White on the 700 block of Westcott Street in 1916 is very typical of the type of resident moving into the new neighborhood. 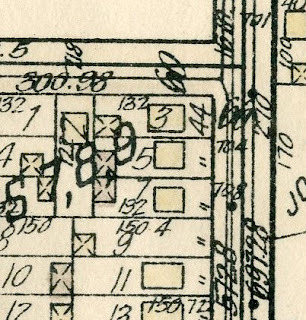 Many young families of white collar professionals found that they could afford to buy or build ample houses in a nice new neighborhood for affordable prices, and the Westcott neighborhood was linked to the Downtown by streetcar. The fact that 716 Westcott Street also only has a modest garage or out building also suggests that this was built more as "trolley house" than as mansion. The garage seems to be contemporary with the house. It has some of the same detailing. 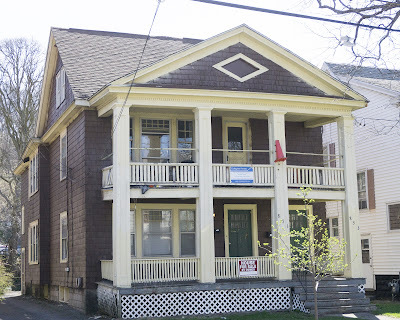 But compare, for example, the impressive garage built behind 317 Clarendon Street, a large Colonial Revival house designed by Justus Moak Scrafford for one family in 1912. 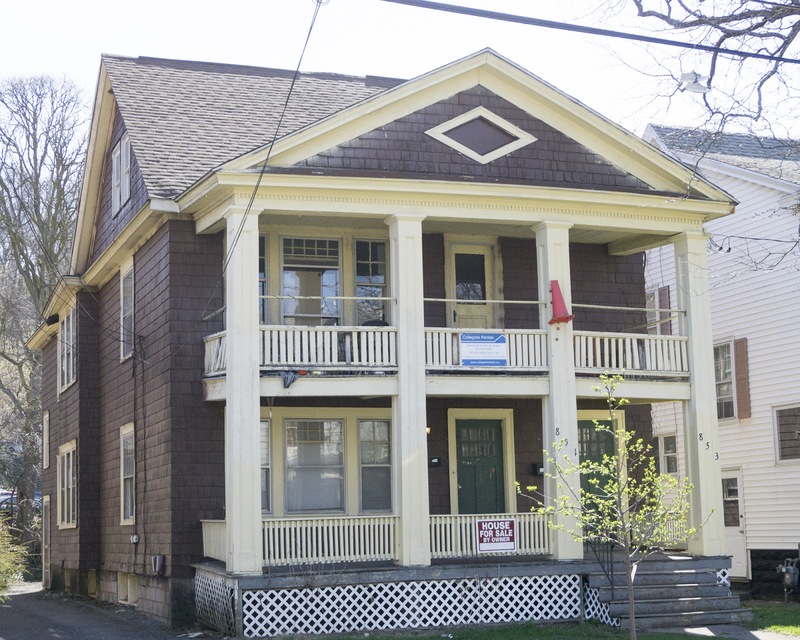 The Westcott Street house, as impressive at it is, is really little different from dozens over other 2-family or "flats" buildings erected in the Westcott neighborhood between 1908 and 1924. Most of these buildings of apartments (flats) are easily recognizable. They usually have two doorways, and almost always have a double level of a generous front porch. The placement of windows, indicating the spaces within, are nearly identical on bottom and top floors. If there is diagonal row of windows, its probably the stairway leading to the upstairs apartment - but not all stairways have windows. A view 716 Westcott Street from the side and rear shows that the house fits this pattern. It's a simply rectangular wood-frame, clapboard-sided box built on mass produced smooth sided cast blocks. Without its impressive classical detailing, the house would not stand out from dozens of other 2-family houses in the neighborhood. But the house does have impressive front and side columns, as well as extensive applied architectural ornament at the corners, around the windows and in the eaves. All this decoration ties the building into the many contemporary Classical Revival civic and commercial buildings of the time in Syracuse and across the country. 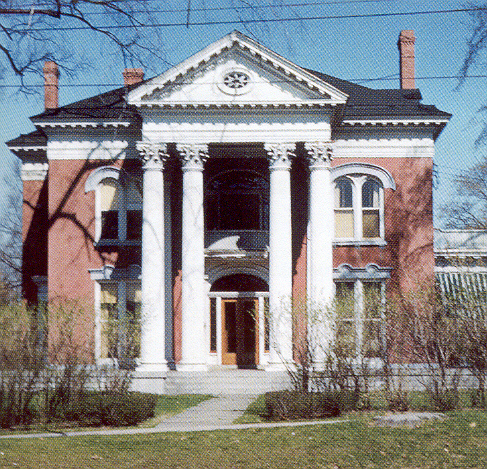 The main entrance facing Westcott Street also links the house to the complementary Colonial Revival style, particularly with the Colonial or Federal style elliptical fanlight over the door and the two style rectangular sidelights. 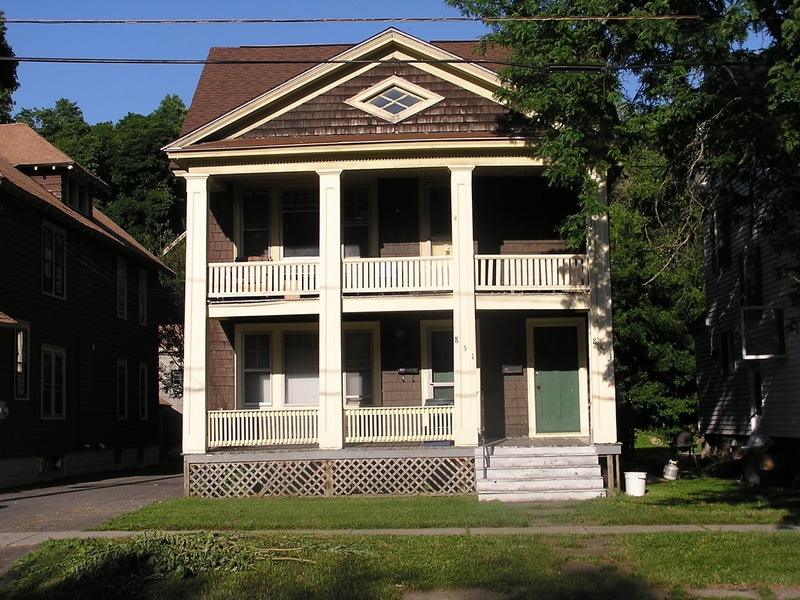 Even though all the elements are of wood and could be purchased through catalogs, the abundance of Classical and Colonial detail indicates an intentional in the design and building to make something notable and grand. Some of these multi-family buildings seem grander than others, mostly be using two-story columns or piers to support the balconies. this usage also ties these buildings in to the then current trend in public buildings which were built in the Classical style, often with giant columns. The style is a new iteration of the classicism that was popular in the early 19th century and that in 1910 could still be seen in the mansions lining James Street. A new full-bodied classicism, inspired by the Columbian exposition in Chicago in 1893 can be seen in Syracuse as early as 1898 in the Psi Upsilon Fraternity House at Syracuse University, and soon after the buldings on the SU quad and many public buildings including the Onondaga County Courthouse (1906), and Temple Concord at University and Madison streets (1910-1911). 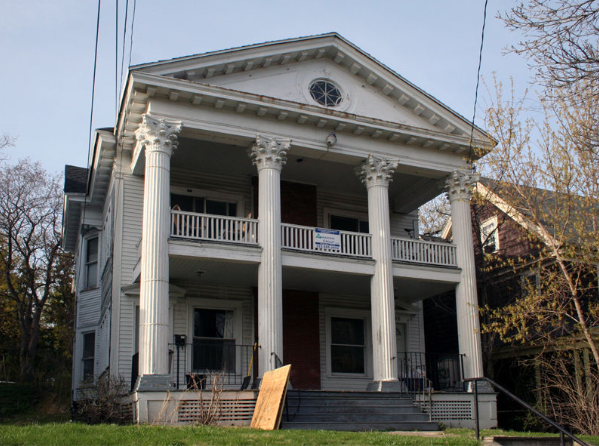 716 Westcott is one of the grandest of the new big columned classical multi-family houses, but there are and have been others. Until it was "remuddled" in 2009, 519-521 Euclid Avenue has four great Corinthian columns supporting its porches, but now these have been replaced by two levels or more modest and meeker tapered piers. Syracuse, NY. 519-521 Euclid Avenue after changes in 2009. Photo:Samuel D. Gruber 2017. 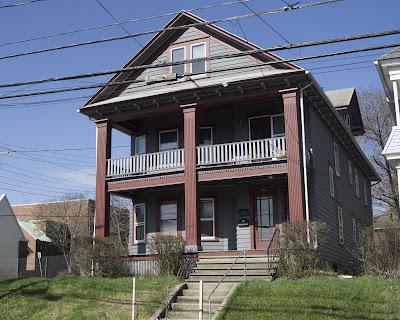 Most of the time in the Westcott neighborhood when 2-story supports are used for front porches on multi-family houses standard square piers are used as at 733-737 Ackerman Avenue, 823-825 Ackerman Avenue, 851-853 Ackerman Ave, 247-249 Buckingham Avenue, 427 Columbus Avenue, 137-139 Cumberland Avenue., 315-317 Euclid Avenue., 851 Euclid Avenue, 919 Euclid Avenue, 1905-1907 East Genesee Street, 2319 East Genesee Street, 232-234 Fellows Avenue, 905 Lancaster Avenue, 1060-1062 Lancaster Avenue, 329 Lexington Avenue , and many more. Syracuse, NY. 851 Euclid Avenue. Photo: Samuel Gruber. Syracuse, NY. 1905-07 East Genesee Street. Photo: Samuel Gruber 2018. Syracuse, NY. 427 Columbus Avenue. Photo: Samuel Gruber 2018. Syracuse, NY. 719 Euclid Avenue. Photo: Samuel Gruber 2012.